Whether you use the hob or the oven for cooking, there are simple ways for you to save on energy costs. 1. Cook in batches: cook as much as possible in the oven in one go to make sure all the space and heat is being used. You can always freeze portions of food to warm up at a later date. 2. Keep the oven closed while you're cooking: when cooking, each time you open the door the oven loses heat and requires more energy to get back up to temperature. Also, try to keep the oven door clean so you can look in, rather than having to open it to see how your food is doing. 3. Defrost frozen food in the fridge overnight: defrosting food in advance typically halves the cooking time. 4. Get to know your oven: learn how long it takes to pre-heat, so you're ready to start cooking as soon as it's up to temperature. 5. Pre-boil potatoes before roasting: by doing so you'll reduce the amount of time they take to cook in the oven. 6. Use glass or ceramic dishes: they're the most efficient to use in the oven and can reduce the temperature required for cooking. 7. Use stainless steel skewers: insert them into baked potatoes and joints of meat to speed up the cooking process. 8. Cut food into smaller pieces: that way it will cook more quickly. 9. Use the fan assist cooking option: this allows you to set the oven at a lower temperature compared to when using the static cooking option. 10.Turn your electric oven off ten minutes before the end of the cooking time: it will still keep to the same temperature for this time period. 1. Always use the right size of pan for the amount of food you are cooking. 2. Put just enough water in the pan to cover vegetables. 3. Choose the right size of burner or ring for the pan. 4. Always put lids on pans to keep the heat in. 5. 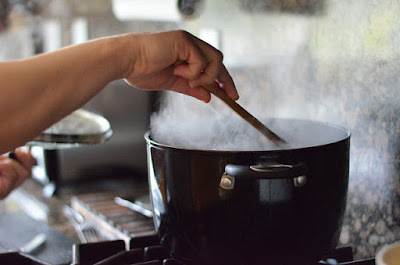 Turn down the ring or burner once the cooking temperature or state is reached; and simmer food rather than boiling it. 6. Use a steamer to cook vegetables, that way you can layer a number of vegetables on top of each other and still use one ring, or use a pan with a divider. 7. Use a pressure cooker for cooking pulses, and even joints of meat, whole meals, or stews. It speeds up the cooking process. 8. If you're using an electric hob, choose flat-bottomed pans so the pan is in full contact with the ring. 9. Certain pan types are better at conducting and retaining heat - copper-bottomed pans heat up quicker than stainless steel and cast-iron pans retain heat more efficiently, so you won't need the heat to be turned up so high.